Vivid scenery and a likable protagonist mark the second book in a series by David Riley Bertsch. In “River of No Return,” Wyoming fishing guide Jake Trent, a former Department of Justice operative with a violent past that has left him emotionally scarred, must deal with a vixen who tries to lure him back to Washington, with the kidnapping of his friend’s girlfriend and with a nefarious population-control plot. The cast of characters also includes a couple of no-good rednecks, an evil U.S. senator, a Chinese megalomaniac and an assortment of locals from Jackson Hole, Wyoming. 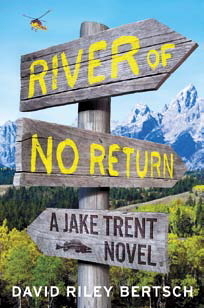 “River of No Return” is a breezy read with locales shifting from Jackson Hole to China, Washington and Idaho, but it suffers from plot twists that at times seem thin and stretch plausibility. Some scenes are shoehorned in. One that doesn’t propel the plot forward involves fishing for steelhead. But of course how could one not have a fishing scene in a novel whose protagonist is a fishing guide? And its extraneousness is redeemed by bright writing.